The Big Bertha Merry Go Round Organ captures the adulation of audiences everywhere she is exhibited. One of three organs that were on a beautiful old Looff Carousel in Ramona Park, Grand Rapids, Michigan, she was put is storage until moved to Gulf Shores, Alabama. Big Bertha is a Limonaire Organ having been made in France in the late 1800's. She was purchased by Paul R. Eakins in 1963, and over 2500 man-hours were spent in completely redoing the organ from August 1963 to June 1966. During 1978, the fifth change in the method of programming was made for Big Bertha. First, she was a Barrel Organ, playing from a 90 key pinned cylinder. Second, she was changed to play from perforated cardboard books of music. Third, in 1913, was converted to play from North Tonawanda endless rolls. Fourth, changed to play from 82 key Artizan rolls. Fifth, now plays from #165 Wurlitzer Military Band Organ rolls. Big Bertha plays 369 pipes, a bass drum, a snare drum, two bells, tympani, double castanets, cymbals, a triangle, and a set of 18 bells. The very ingenious snare drum action stems back to the great Leonardo Da Vinci who designed this type of arrangement. The triangle perforations now activate the two comely bell-ringers. The Director, Big Bertha, is in time with the bass drum. The piccolos now play intermittently with the trumpets. When the piccolos are playing, the bell-ringers play in unison with the bass drum. The THA holds the baton with her right hand, and when she turns her head to the left, directs in time with the bass drum; when she looks straight ahead again, she raises her left hand. She is flanked on either side by a bell-ringer. The three figures are beautifully proportioned and resemble real people. Handcarved, the embellishments are colorful and elaborate. On the top grille is an unusual figure-head resembling Columbus. Two charming cherubs with carved gossamer drapings also adorn the grille. At the lower center of the facade is a very savage-looking gargoyle. These are all fine examples of the highly specialized art of wood-carving. Big Bertha is truly a work of art and her music is very exhilarating, bringing back the nostalgia of bygone days. Hot Lips Hoolihan has 44 keys insuring a wide range of melody. Instrumentation: Inside - 14 Wooden Piccolos; 14 Wooden Flageolets; 5 Open Basses; 14 Violin Pipes Melody; 13 Wooden Trumpets; 9 Open Pipes in Accompaniment; 6 Stopped Pipes in Melody. Bottom - 5 Stopped Basses; 9 Stopped Accompaniment; 8 Stopped Melody. Five Stops - 1 for Piccolos; 1 for Flageolets; 1 for Melody; 1 for Accompaniment and 1 for Trumpets. Dimensions: Height 4 feet 1 inch; Width 3 feet 6 inches; Depth 2 feet 4 inches. Case made of golden oak. This colorful Band Organ was formerly owned by a well-known Carnival owner, one of the most well-respected men in the industry. The organ had been used of their beautiful Carousel and was shown and heard all over the Eastern, Southern, and Central part of Missouri. The Carnival was based in Cape Girardeau, Missouri. Always kept clean and freshly painted, the Carnival was welcomed wherever it played. The same man who took care of the Carousel for over 25 years, also took care of the organ. The owner's Widow sold the machine to Paul R. Eakins in 1976 and he completely redid the organ. A new case was made and the pipes were cleaned, revoiced, and tuned. Hot Lips Hoolihan was named after a friend who delights in the music of Band Organs. Look at a Seeberg "E"
This machine, the Style "E" was recorded under typical barroom conditions. You may hear a phone ring, a customer move his chair, or any other sounds usually heard in a bar. Used in a family-owned business, the great sounding Style "E" was on location until the place closed. It was then stored in the family residence, until purchased by Paul R. Eakins. The "YALLER DAWG SALOON" located by a riverfront, was an exceedingly busy place until Prohibition closed it. Crowds of men clamored for more music when the machine stopped playing. Since it was coin-operated, they gathered up their change and took turns dropping in their coins. At times, the purchase of drinks slowed up, so the Bartender would start up the machine. Boisterous singing took place, and often a slug fest. The burly bartenders usually kept a shillelagh, blackjack, or brass knocks on hand to quell disturbances or acted as a "bouncer" and not ungently tossed or escorted a trouble maker outside. Not only were the tearjerker tunes in demand, but also the old favorite ballads such as "Pretty Red Wing", along with lively polkas, and ragtime music. Ladies had their own entrance so they could slip in without attracting too much attention and avoid ostracism by other females. If a gent didn't go to the Saloon, he sent a youngster after a 5 cent bucket of beer, so he could relax after a long day of hard work. Taking off his heavy work shoes or boots, he propped up his feet and read the newspaper and enjoyed his "suds". The Style "E" has decorative and elaborate illuminated are glass panels with colorful scenes of rolling hills, trees, a lake with a sailboat, and a house with a red roof. Bright blue columns with brass overlay complete the scenes. Burnished brass art lamps are at each side in the top frame. Equipped with automatic loud and soft control and a tempo-regulator, it uses Style "A" 65 note ten-selection music rolls. Has a new and original scale of seven and one-third octaves. Plays flutes, piano, and mandolin. It has the serial number 54355 and was made in 1915. Loudmouth Sadie Mae was made in France in the late 1800's by Gavioli, who has been called the greatest of all organ makers. She is a Military Trumpet Organ. There were 99 keys and although it played from a pinned cylinder called a cob at one time, it was converted to play from 87 key books of music. Along with the many brass pipes and wood pipes, she plays bass drum, snare drum, cymbal and 17 tuned wood pipes, she plays bass drum, snare drum, cymbal and 17 tuned bells. The list of pipes include 20 trumpets; 8 trombones; 17 octave violins; 17 open violins; 17 flageolets; 17 piccolos; 20 accompaniments; 30 bass; 17 clarinets; 17 stopped flutes; 17 cellos. There are 8 manual stops; for clarinet and flageolets; for piccolos; for trumpets; for octave violins; violins; for trombones; for part of the bass, part of the accompaniment, and all of the melody section; for the rest of the bass, the rest of the accompaniment, and all of the cello section. There is one automatic stop for the bells. Loudmouth Sadie Mae plays from books that are of special cardboard from Sweden. The books are cutover in Europe, being especially arranged for her keyframe. We call the keyframe the "brain" for this is the system that controls the entire machine. These books are the forerunner of the modern "punchcards" and stem back to the Jacquard patent of early days. The entire facade has an abundance of magnificently carved decorations. Behind the beautiful brass pipes, may be seen the lovely blue and brocade that sets off the showy brass horns. The main body of the organ is a flamboyant pink with trim of gold, reds, blues, aquas and silver. The central figure is the director, hand-carved from one piece of wood, excluding the arms. Her movements are synchronized to the music. She moves her baton when the bass drum and cymbal plays, and raises her left arm and turns her head to the front when the bells play. Big Nelly was used by a Carnival from Belleville, Michigan until stored for lack of maintenance. It was purchased by Paul R. Eakins and completely restored. Big Nelly is a marvelous machine. The original paintings on the front have been preserved. The main body of the organ is painted in colors found under many coats of paint. Big Nelly Military Band Organ was made by the Artizan Factories, Inc., of North Tonawanda, New York around 1928, and bears the serial number 573. She plays from 61 key Artizan rolls. Instrumentation includes: bases, open, octave and contra; wood trombones; wood trumpets; violin; open and stopped pipes in accompaniment and melody; 20 inch bass drum; 14 snare drum, cymbal; and 1 set of bells. This organ also plays solo effects with automatic stops for trombones on, violin on, and all off. When one roll finishes, the other starts playing, and the first rewinds. A fascinating organ that delights all who hear her, for she plays all types of music with ease. The "H" plays tunes with great gusto, and the solo sections enhance various types of music from blues to semi-classical. It carries out the motto "Dependability, Efficiency." Often called the " Masked Marvel," it is equal to a seven-man orchestra. The music rolls have been hand arranged to plan wonderful solo effects. Plays Style "H" rolls. Instrumentation: New and original scale piano of seven and one-third octaves and three unisons throughout, with mandolin attachment; 68 pipes-violin, piccolo, flute, oboe and clarinet; castanets; and xylophone. Drums or any other effect can be shut off at will. A strong feature is the patented loud and soft drum effects. It is equipped with tempo regulator on outside below key-bed. Magazine slot registering 1 to 20 coins. Seeburg master had-arranged solo music rolls contain 10 selections on Seeburg rewind system. This wonderful Circus Calyope is a Wurlitzer Caliola with 44 wood pipes and is ideal for circuses as it has a beautiful tone and remarkable volume. It plays from a paper roll or may be played manually from the keyboard on the back, creating beautiful musical effects. This machine was made in 1928 and uses the regular 65-note Wurlitzer roll. Operated by a ½ h.p. motor. Specifications: Height to top of scroll, 5 feet 4 inches; height without scroll, 4 feet 8 inches. Width, 3 feet 7-½ inches; depth, 2 feet 10 inches. Weight 435 pounds with countershaft and drive wheel, 44-note keyboard for hand playing. 44 pipes. The music machine heard on this album is a Tangley Calliaphone, often called a Calyope by the circus people. The Calyope with its bright red case and 43 gleaming brass whistles, was made by the Tangley Company, of Muscatine, Iowa. Mr. Norman Baker invented the first Tangley calliope and later perfected the Calliaphone. 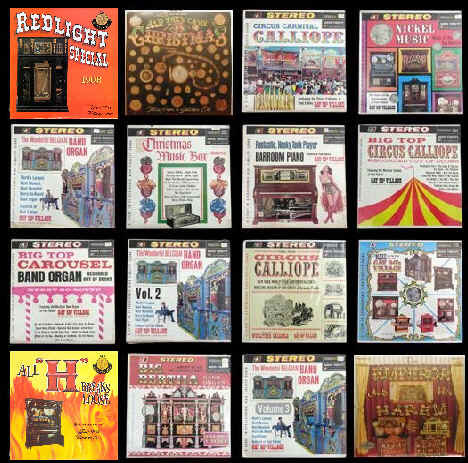 Calliaphones had different voicings -- loud for circus, carnival and ballyhoo purposes, and soft for theaters, shows and dance halls. Tangley advertised that they made 98% of all air calliopes in use. They claimed the tone was the "first new tone in forty years." This calliope's brass plate on the side states Tangley is the World's Largest Calliope and Calliope builders. On the patent plate, the last date is October 1924. Serial #1422, Model CA-43. Gauge pressure 1-1/4. Speed of blower 740 rpm, pressure range 1-1/4. Plays 41 pipes from an "A" roll automatically. If the machine is played manually from the keyboard, you can play all 43 pipes. It is possible for each note to sound approximately 10 times per second. This machine was restored in 1974 and given the name of Clancy O'Toole. The Queen of Kings Island is a magnificent Wurlitzer Duplex Orchestral Organ Style #157. It was originally used on a carousel at Ocean Grove, New Jersey. It was purchased in 1964 by Paul Eakins and completely restored. Playing #165 Wurlitzer rolls, it has a double tracker system, furnishing continuous music. When one roll finishes playing, the other starts and the first one rewinds. The beautiful light cream front is heavily carved and the panels and shutter screens are painted with landscape scenes. The newel posts are painted to resemble marble columns. The following instruments are played: Bass - 6 wood trombones; 6 stopped diapason pipes; 6 stopped octave daipason pipes. Accompaniments - 10 stopped flute pipes; 10 open flute pipes; 10 open piccolo pipes; 10 open piccolo pipes. Melody - 44 violin pipes; 22 octave pipes; 22 piccolo pipes; 22 open flute pipes; 22 stopped flute pipes; 16 bar bells. Trumpets - 14 wood trumpets; 14 wood clarinets. Traps - bass drum; snare drum; cymbal; triangle; double castanets; tympani. Automatic stops - 1 for bells; 1 for swell and wood trombones. Draw stops - 1 for wood trombones; 1 for wood trumpets; 1 for violins; 1 for flutes; 1 for piccolos. The Queen of Kings Island stands nearly 8½ feet tall, over 12 feet wide and nearly 4 feet deep. Pinkey is a beautiful 65 Key Gavoili Fair Organ and was made in the late 1800's in France. At one time it played from a pinned cylinder, and was used on a huge Carousel in a German Park. Later, it was brought to the United States and converted from an 89 key organ to play from 82 key Artizan rolls. It gets its name from the pink trousered bandmaster. It plays hundreds of pipe, bass drum, snare drum, cymbal, and two bells. Pinkey has an elaborately carved facade with three articulated figures. The bandmaster is a unique left-handed conductor and the bell-ringers solemnly tap their bells when the music calls for them. At each of the lower corners may be seen a gorgeous heavily carved rose with petals extended just a real full-blown rose has. Elaborate carvings and scrollwork also adorn the machine and graceful vines encircle the newel posts. The stately Emperor was made in Belgium by Mortier before the turn of the century. At that time it played from a pinned cylinder called a "cob." The cardboard books of music it now plays from are made of a special material from Sweden with flax in it to keep the perforations sharp and clear. Instruments played by this machine include 418 pipes, bass drum, cymbal, snare drum, double castanets and 22 xylophone bars. Its effect is similar to that of a 60 piece orchestra. The following is a list of instruments as they are controlled by the "brain" or keyframe as shown on the original gamut book; madolinne, piston, xiliphon, trommel snare and cast, tremelo, gross caisse, klein fluit, groote fluit, harmonium, violincelle, saxifoon, trombon, voisc humaine fixe, voisc celeste, violon. Every piece of this organ was hand made-even the brass vox humnan pipes were swedged and flared by hand. The ingenious tremelos will produce, with the vox humana, violin, diapason, and melphone, a marvelous sound not unlike the human singing voice. The term Jenny has been used for many years for merry-go-rounds and stems back to the days when organs and carousels were steam operated. This particular machine was used by a very famous large carnival many years ago in Florida. It is a Wurlitzer Style #103. A little wood trumpet organ with 41 keys, it plays from Style #125 paper rolls of music. Designed especially for miniature carousels, kiddie swings and other amusement rides, it holds its tone will and is not affected by sudden temperature changes. The #103 is loud enough for larger rides. Small, but very compact, it has exceptional volume for its size. Instrumentation: 5 wood basses; 9 wood accompaniment pipes; 14 wood violins; 14 wood flutes; 13 wood trumpets (on draw stop). This organ was one of the most popular Wurlitzer styles. Production was from 1923 to 1937. Katy Lou is a Wurlitzer Style #153 Duplex Orchestral Organ. This type was used on three-abreast carousels, in open dance pavilions, skating rinks and other amusement areas. The machine was made by the Wurlitzer Company on North Tonawanda, New York. It has 54 keys and plays from paper rolls of music. According to the original Wurlitzer catalog, it has duplex long roll Tracker Frames and latest drums with self-tightening tension rods. "It is hard to make such organs today and you can hardly even find a musical equipment lease for such an instrument." Instrumentation: Basses: 3 wooden trombones; 3 8-foot stopped diapason; 3 4-foot open diapason; 3 2-foot stopped diapason. Accompaniment: 9 stopped flute pipes; 18 violin pipes. Melody: 16 stopped flute pipes; 16 octave violin; 15 wooden trumpets; 15 cello pipes; 32 violin; 15 open flutes; 15 stopped pipes; and 16 bell bars. Traps: bass drum; snare drum and cymbal. Automatic Stops: 1 for octave violin; 1 for open flute; 1 for cello pipes; 1 for stopped pipes 1 for bell-bars 1 for swell shutters. She stands over 7 feet high and over 8 feet wide and has a double-tracker system for uninterrupted playing.